Tim Cain and Leonard Boyarsky are tired. As the most recognizable faces on The Outer Worlds, the new Obsidian RPG that is drawing comparisons to Fallout: New Vegas, they are spending a great deal of time in front of fans and the media. When I talk to them, they're just wrapping up their panel, in which they showed a new area, Byzantium, and new gameplay footage. The PR representatives assure the pair that ours will be the last interview, and that it will be quick, but Boyarsky briefly steps out anyway. That leaves me with Cain, who starts slowly but begins to talk faster and faster as he gains momentum. He mentions the forthcoming Vampire: The Masquerade - Bloodlines 2, the sequel to the cult favorite RPG he worked on with Boyarsky 15 years ago. "I liked working on Vampire," he says. "Somebody asked me recently if I've replayed any of my games recently, and I replayed [Vampire: The Masquerade - Bloodlines] a couple years ago. I picked a different clan, and it's super fun and it's held up, and I'm sorry it's taken 15 years for a sequel. I'm glad people waited." Cain comes off as one of the rare older developers to retain his passion for games. He has been in the games industry for more than 25 years, his most significant contribution being the creation of Fallout along with Boyarsky. Talking about Vampire: The Masquerade and The Outer Worlds, his fatigue falls away and his enthusiasm quickly returns. With The Outer Worlds, Cain and Boyarsky are back in their element. While they've worked on RPGs since the closure of Troika, the studio they helped to create, this is the first original property that they've headed up together since Bloodlines. It's a tremendous opportunity for Cain and Boyarsky's team, for Obsidian, and maybe for Microsoft, which recently added Obsidian to its growing collection of studios (The Outer Worlds is currently being published by Take-Two Interactive's Private Division label, but any sequel will no doubt be handled by Microsoft). After all, it's not every day that one gets to establish a new blockbuster IP. With Bethesda faltering in the wake of Fallout 76, and fans absolutely starved for another Fallout or Elder Scrolls, The Outer Worlds is being treated as a big deal, even if it isn't strictly the same as those two titans of the roleplaying genre..
Their vision for The Outer Worlds is a first-person shooter RPG in which players recruit a crew and take on missions among a handful of planets, from the glittering Byzantium to the monster-filled Monarch. One part Futurama, one part corporate dystopia, it imagines an alternate history in which the Gilded Age continued unabated and all of public life became dominated by corporations. Cain and Boyarsky imagined that it was due to William McKinley never being assassinated, and were amused when fan theories went down a similar path (for now, the team prefers to leave most of the lore up in the air). When work on The Outer Worlds was just getting started, the pair peppered new hires with music, TV shows, and movies to serve as reference material. On the PAX East Outer Worlds panel, senior narrative designer Megan Starks said she wondered what she was getting into when Boyarsky recommended she watch Brazil, the mindbending dystopian film by Terry Gilliam. She tells me after the panel, "I think that movie was something that Tim and Leonard really liked for the dark humor, and just the crazy experience of what this alternate society is like." When I ask Cain about his reasoning for asking the team to watch Brazil, he admits that his own contribution mostly skews toward Futurama. But there's one element of Brazil that definitely jumps out at him. "One thing we like about it is that it's a dystopia that tries to put this veneer of everything being fine, and that you should just do your job." He refers to the scene where Ida Lowry, mother to protagonist Sam Lowry, goes on eating even after a bomb explodes in a restaurant. "All this terrible stuff was happening and she didn't care," Cain says. My interview is happening in the wake of The Outer Worlds' gameplay reveal featuring Byzantium, a planet that in some ways resembles the world of Brazil. Cain positions it as a planet that looks incredible from a distance-one that players can't even visit at first because it's off-limits-but is rotten under the surface. "One of the things we did in our first trailer was show a scientist trying to develop the perfect diet toothpaste, and he's like, 'If this sells well, I can go live in Byzantium.' So we get to not only hold it out as this goal, but when people arrive there and see what it's really like, it's fun for the player to have the illusion dashed a little bit. We like doing that." In the quest shown at PAX East, the player poses as an actor in a corporate propaganda film, using dialogue to subtly mess with another actor until they finally figure out that the protagonist is toting real weapons. The streets run through a canyon of skyscrapers that have an art deco look to them, with seemingly every surface plastered with propaganda posters and humorous advertisements. Robots and Mandibular Rearrangers aside, it's a world that doesn't feel so different from our own increasingly corporatized reality, which is surely the point. By this time, Boyarsky has returned to the table, and he starts to compare how The Outer Worlds and Bloodlines tackle social issues. Where Bloodlines is about "dealing with [social issues] in an almost cutting edge kind of way,", Boyarsky says, Outer Worlds has a biting and satirical edge to it. "In this, we're trying to explore these corporations that are running the world the way they want. There's nothing standing in their way. This is the perfect utopia for corporations, and we explore what that would mean." Indeed, The Outer Worlds' social commentary is a large part of why it doesn't have crafting, lead designer Charles Staples tells me in a separate interview. "One of the reasons we sort of shied away from it was with all the corporate branding that we had. We felt like doing a lot of your own crafting sort of took away from one of those themes that we were trying to hammer on quite a bit and get across. So if the players were doing just a lot of making their own things, it sort of lessened that message that we were trying to talk about. But we still want to allow a little bit of customization. We support that through modding weapons and armor." Such social commentary certainly wouldn't be out of place in Fallout, which is at least one big reason that Outer Worlds is so hotly anticipated. To long-time fans this is the real deal, a large-scale RPG directed by two of the genre's masters. Even the sense of humor is similar, heavy as it is on hapless robots and references to consumables like "Stimu-Lotion," which Starks dryly calls "a lotion that is stimulating." 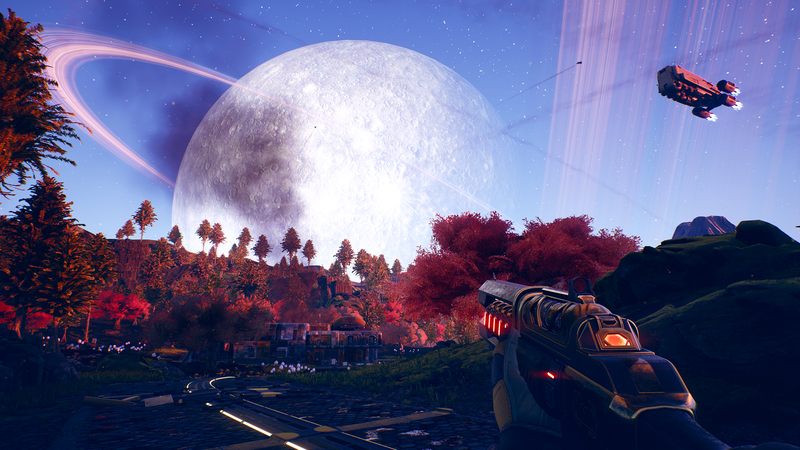 When The Outer Worlds was announced during last year's Game Awards, it garnered immediate notice as it was contrasted with the disappointing Fallout 76, which launched the month prior. But its structure largely precludes it from being a "true" open-world game, Boyarsky says. "It wouldn't be the same if you had one giant place to explore, and you just flew your ship from place to place on the same planet. Kind of removes the whole space opera feel to it." Cain adds, "It was partially pragmatic because Unreal doesn't really like truly big open areas. But part of it is how we like to tell a story, and you kind of have to have some direction in a non-linear narrative." You also get the sense that Cain and Boyarsky are working with relatively limited resources. When the decision to avoid romances comes up, Cain says, "I think it takes a lot of work to do it. There are whole games that that's the genre, that's all they focus on. There's all those dating sims in Japan. If we can't do it well, we're not going to do it because the amount of narrative stuff we'd have to focus on to get this working would be intense." Boyarsky chimes in, "Yeah, I mean, this is a smaller budgeted game than people probably think, and we had to pick and choose what we wanted to focus on. And there's been games in the past where it just seemed like a scorecard. We didn't want to trivialize relationships, we really wanted well-rounded characters, and it felt almost like unless we brought something new to it or put a lot of work into it, it was just going to be like, 'Here's this great, well-rounded character. Oh yeah, you're going to sleep with him.'" But size isn't everything. There are plenty of benefits to keeping an RPG tight and focused (bugs for one). And with Outer Worlds being so heavily focused on decision making, there will likely be an impetus to play through the whole quest multiple times. To wit, there's a point where Boyarsky mentions a major divergence that can occur depending on a key decision you make. "One of the ways to get to Byzantium early is to decide you're going to side with the Board Room. So that's a totally different path. The game diverges and comes back together later." There's a lot of interesting potential to be found in decisions like these, especially since cozying up to the board affects the price of goods at vendors. Depending on the decisions you make, you could open up some interesting story possibilities, but at the cost of making the actual game harder. So if you decide to go full renegade-it will be possible to kill every NPC in Outer Worlds-you'll potentially be facing some major gameplay consequences. Even more interesting is the potential to short-circuit the progression altogether. Anyone who's played the original Fallout will know that you can basically skip a large chunk of the game and go straight to the Necropolis, assuming you know what you're doing. Amusingly, Boyarsky actually says that little shortcut was unplanned, after which Cain interjects, "Although, we do have a bit of a short-circuit in this game that's planned for." "Yes, but in general, that was an extreme version that we hadn't planned for," Boyarsky continues. The idea they have for Outer Worlds is something similar to Fallout: New Vegas, in which players are able to go straight from Goodsprings to New Vegas provided they're able to survive a gauntlet of high-level enemies. "The thing that appeals to us almost more than anything else is letting the player play however they want to play within the bounds of reasonable development cost. We want to let them make the choices that they want to make. We've all played games where it's just like, 'I don't have the choice. They're not letting me make the choice I want to make here.' So we try to avoid that. But the key words once again are "development cost," and Boyarsky admits that development is getting harder. He talks at some length about how time-consuming it can be to implement shaders, textures, and real-time lighting, even if they ultimately want their artists to be happy with the art they're making. "That just makes you step back and kind of really rethink, okay how are we going to reuse a lot of this stuff, how are we going to be smart about what we build and how we build it. But that kind of comes with the territory. On other games, we had to overcome a lot of different things when we were using the Half-Life 2 Source engine." Perhaps that's why Cain, Boyarsky, and the rest of the team seem so beat. They're not just trying to make an ambitious RPG, they're doing it from scratch. As Starks points out, Fallout has older assets to draw from, but everything in The Outer Worlds is brand new. "With Fallout: New Vegas, you already has a really rich IP and a lot of previous games to build off of. Also that engine and tool set and a lot of those assets already existed, and we're building everything from scratch." Staples adds, "From my perspective as the lead designer, it's been a big challenge of just trying to make the type of game we're trying to do in the amount of time we have. We want to do a lot. There's a lot of big ideas, and it's a lot of systems, and a lot of different types of gameplay. It's a lot of work to put it all together, and it's been challenging, but I think the gameplay is coming together and it's fun. We have fun playing it." Their single-minded determination to build massive RPGs on a limited budget has burned them in the past, of course. Vampire: The Masquerades - Bloodlines may be a classic, but it was a buggy mess when it shipped; and when it tanked, it took Troika down with it. "I really pay more attention to scope control," Cain says a tad ruefully. "Vampire was much bigger than the team we had making it. And often I'll pay a lot more attention to bugs earlier in development, because we let some things go on for so long that eventually they ship with those bugs, and nobody wants that." Regardless, while it may be too much to ask for The Outer Worlds to live up to the expectations heaped upon it, what's there already looks dense, creative, and ambitious. We'll see how it all turns out, but it's obvious that Cain, Boyarsky, and the rest of their team aren't about to let this opportunity pass them by. The Outer Worlds will be out on PS4, Xbox One, and PC later this year. Tagged with Feature,	obsidian,	PAX East 2019,	PC,	PlayStation 4,	Role Playing Games,	Xbox One.